Off the beaten path offers exeptionaltravel experiences designed to help you explore the natural world. Meenmutty Falls is located 45 km from Trivandrum city in Thiruvananthapuram District in the state of Kerala, India. This waterfalls is located near the Neyyar reservoir area. No transportation is available till the falls. The visitor has to trek through the dense forests to reach the falls. The Kombaikani waterfalls is also near to Meenmutti. It is 2 km upstream the Meenmutti falls. 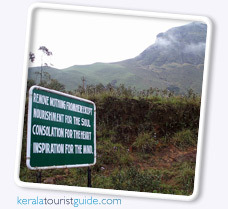 Eravikulam National Park is a 97 km� national park located along the Western Ghats in the Idukki district of Kerala. The park is administered by the Kerala Department of Forests and Wildlife, Munnar Wildlife Division, together with the nearby Mathikettan Shola National Park, Anamudi Shola National Park, Pambadum Shola National Park, Chinnar Wildlife Sanctuary and the Kurinjimala Sanctuary. Twenty six species of mammals have been recorded in the park including the largest surviving population of Nilgiri tahr, estimated at about 750. Other ungulates are Gaur, Indian Muntjac and Sambar Deer. Golden Jackal, Jungle Cat, Wild dog, Dhole, leopard and tiger are the main predators.